The Dynamite chased the target down with 20 balls to spare. In the group stages, Chittagong Vikings defeated Dhaka Dynamites twice, but that wasn’t the case in the Eliminator of this year’s Bangladesh Premier League (BPL) as the Shakib Al Hasan-captained Dynamites comprehensively won by six wickets and progressed to Qualifier 2, which will be played in Dhaka on Wednesday, February 6. In the meantime, the Vikings’ campaign in this edition’s BPL came to a close. The Vikings elected to put runs on the board after winning the toss, however, could only manage 135 for eight in 20 overs. Yasir Ali opened the batting with Cameron Delport and fell for eight to Rubel Hossain. Delport was looking ominous and had got the measure of the difficult batting conditions, having scored 36 from 27 balls. He got out to a shambolic mix-up with partner Shadman Islam that led to his run-out. Thereafter, Sunil Narine came to the party and got the big fish in Mushfiqur Rahim. The tweaker then nipped out Shadman, who threatened with a 19-ball 24. The Windies spinner also accounted for Robbie Frylinck and Hardus Viljoen’s wickets. Amidst a poor batting performance, Mosaddek Hossain mustered 40 runs with three fours and a six. For the Dynamites, Rubel and Qazi Onik picked up one wicket each. Sunil Narine and Upul Tharanga took the bowling by the scruff of its neck and put on 44 runs for the first wicket in a mere 27 balls. The latter threw the bat at everything and scored 31 runs with six fours and a six before Khaled Ahmed got the dangerous batsman. 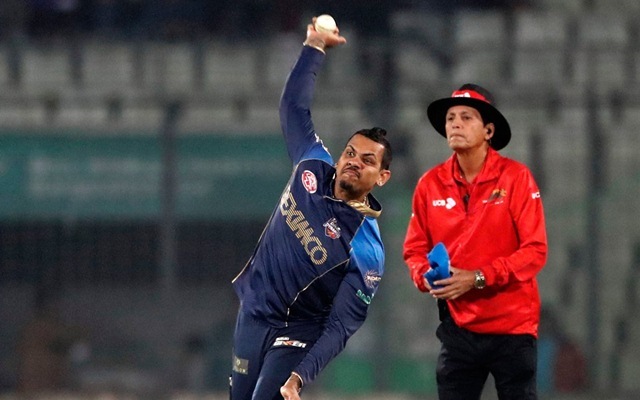 Rony Talukdar was promoted to number three and he didn’t disappoint by any means as he racked up 20 runs off 13 balls with a four and six apiece. Talukdar was trapped in front by Ahmed. In the very next ball, Khaled pinned Shakib for a golden duck. At the other end, Tharanga looked at his best and ended up scoring 51 runs from 43 balls before throwing his wicket away to off-spinner Nayeem Hasan. His knock was laced with seven boundaries. Nurul Hasan remained not out on 20 to make sure that Dhaka Dynamites complete the win with 20 balls to spare.